If you’ve ever wanted to see a pre-schooler’s eyes light up, mouth drop agape and arms start flapping as they excitedly run towards the television, those are the words that are likely to set them off. They’re the opening lines to a great, New Zealand made children’s television programme called “The Moe Show”. Moe is a big, friendly, furry monster who lives in a treehouse, as previously stated, on top of Mount Moehau on the Coromandel Peninsula, along with his friends Fern the fairy, Frank the fantail and Gilbert the gecko. Each episode Moe encounters a problem which he must overcome. A letter of the alphabet gives him a hint as to a possible remedy and he ventures from his treehouse to locations all over New Zealand to discover the solution. Imbued with the same qualities and ethos as the likes of the legendary Sesame Street, each episode involves elements of investigation, exploration, Te-reo Maori, lots of fun and a decent dollop of humour for both children and any adults watching with their kids. I particularly love Moe’s one liners to the narrator’s “Do you know what you need?” question that sets Moe off on his journeys and the “Moe, Can I be Frank with you?” chats that Frank and Moe have towards the end of each episode. We just happened to be fortunate enough to meet Moe earlier this year on one of his quests! 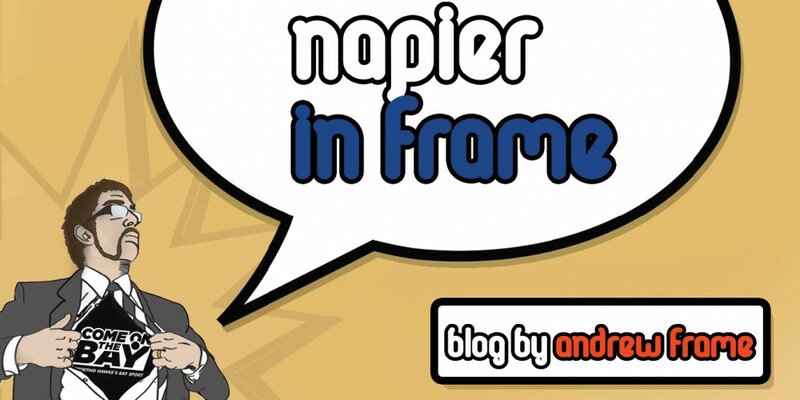 The Napier in Frames were at our regular Saturday morning café when the overheard the manager of Marine Parade’s SK8 Zone, who had come in to get a coffee, mention that Moe was visiting to find out about Skate parks (“Papa Retireti” in Te Reo). We wandered over to watch the show being filmed from outside the skate park and when Moe saw Daughter in Frame watching in her pram, he came over to meet us! While Daughter in Frame played with Moe, Moe’s friend Jeremy told me about and showed me pictures of his trip to (someone had told him how to get, how to get to) Sesame Street. Jeremy and I are around the same age, so we both grew up in the 80’s basking in the golden light of great children’s television like Sesame Street, The Muppet Show, Fraggle Rock, New Zealand’s own Woolly Valley (““Baa” said Eunice”) and, later on, The Son of a Gunn Show’s Thingee. These are the shows that taught and inspired us. We fell in love with the characters and places they took us to. To meet and talk about these great shows with someone who was involved in making a similarly great show and had actually walked down Sesame Street, visited Hooper’s Store and even a certain trash can said to be of Tardis-like interior dimensions, made me quietly greener that Oscar the Grouch. But it also made me extremely happy. It shows that, at least in the case of Moe and his friends, the future of New Zealand children’s television is in good, safe hands. The Moe Show is brilliant – well worth a watch for both children and their parents or guardians. It’s an intelligent, funny, multi-cultured show that not only teaches children new words, facts and things, it also takes them to new places and implores they then get out and discover things all around this great country of ours for themselves. That’s the magic of Moe! This entry was posted in Hawke's Bay, Humour, Media, Opinion, Social Media, Writing and tagged Hawke's Bay, Humour, Media, Napier, Opinion, Social Media, Sport, Writing, Youth by Andrew Frame. Bookmark the permalink.